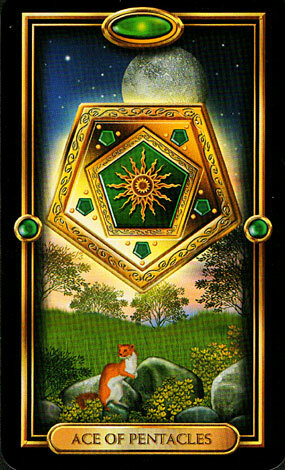 The King of Pentacles Reversed. Also known as the King of Discs or Coins Reversed. This King has sterling qualities when functioning at his best. He is a hard worker, often good with money, conscientious, a good provider. He’s practical and capable. He has warmth – likely to be kind to women, children and small furry animals. He may well be green fingered. 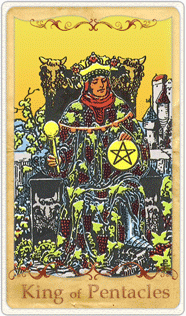 Rider Waite King of Pentacles Dignified, U.S Games. He eats up his food, and often appreciates small and simple things…and this is a high quality and not to be despised in this world. He is careful, honest and faithful. He is sturdily masculine. When ill-disposed however, and appearing as a subject of complaint, it is often because he’s habit ridden, perhaps miserly, a grumpy git, liable to be slovenly or dowdy and to have whiffy feet. He’s being a refusenik; rigid, narrow, stubborn, petty, dull, gluttonous, lazy or alternatively, he’s a workaholic, knowing the price of value of nothing, obessed by minutiae, failing to see all manner of wood for the trees. Well, let’s try respect, charity and compassion first…maybe the poor tatty bear is over-worked, stressed, depressed, run down and tired. Failing that, maybe he needs to pull his interpersonal socks up. If you have one like this, do acknowledge and praise whatever is his useful contribution, do allow him to shine, feed him greens, buy him a new shirt or lovely aftershave, do try and tempt him into the fresh air, but be prepared to go out without him if he refuses to stir, and don’t buy him slippers. Above all not tartan ones. It’ll encourage him in all the wrong habits. Author Katie-EllenPosted on September 22, 2010 September 23, 2010 Categories agony aunt, psychic, psychic development, psychology, tarot, UncategorizedTags katie-ellen hazeldine, king of pentacles, tarot, truetarotLeave a comment on Don’t Buy Him Slippers.